3,600 years before Luke Skywalker was bulls-eyeing womp rats in his T-16, the galaxy was enveloped in an all-out war. After over 20 years of fighting, the Sith Empire and the Galactic Republic met to forge Treaty of Coruscant, a document that ended The Great Galactic War in an extremely uneasy stalemate. Battles and skirmishes still flare up in the years following this agreement, and the universe is on-edge at all times. It’s here, during this Cold War, that the most important MMORPG since World of Warcraft takes place. The main reason for the high expectations comes from the developer: BioWare. Being the creators of the Knights of the Old Republic, Mass Effect, Neverwinter Nights, and Dragon Age franchises means that the studio carries with it an air of quality, and not since Blizzard has such a well-respected developer entered into the MMO arena. It’s also a Star Wars game – and an expensive one to boot – all of which set expectations sky-high. Does BioWare break the mold? 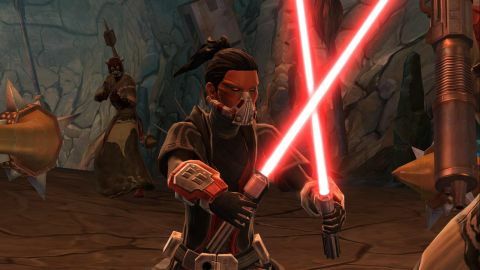 Or is SWTOR just “World of Warcraft with lightsabers” like many have predicted? Utilizing a setting thousands of years before A New Hope allowed BioWare a lot of freedom with its MMO, and it took full advantage of everything the era has to offer. Several hundred years after Knights of the Old Republic there are still plenty of Jedi and Sith rampaging about the cosmos, giving BioWare the license to include Force-using classes while abiding by the canon. Both sides have two Jedi and Sith classes, with the Sith Empire getting Bounty Hunters and Imperial Agents to the Republic’s Smugglers and Troopers. Breaking it down even further, each class is specialized at level 10 – a permanent focus that allows for extra customization. We could play our Sith Inquisitor as a healer or damage dealer by choosing to go Sorcerer, or as a double-sided lightsaber-wielding stealthy tank as an Assassin. Choosing a specialization provided us with a traditional talent tree to further shape our character, and though they’re arguably more impactful than those found in other MMOs, were still fairly recognizable to anyone who has played a game in the genre. While BioWare took some strides towards reinventing the genre, much of their game is still locked in the past. Combat, for instance, is fundamentally the same as every other MMO on the market. You’re playing whack-a-mole with a few bars full of abilities, tapping the corresponding number when the skill you want to use pops up. It works, just as it did in EverQuest eleven years ago, but it’s a mechanic that’s begging for an overhaul. The basic system that alerts enemies to your presence, too, is in dire need of work – as gaming evolves it becomes increasingly puerile that foes in the same room as us will wait to be approached before attacking, even as we brutally murder their friends ten feet away. Some other areas of SWTOR aren’t even as advanced as other modern games in the genre: the UI isn’t nearly as customizable as it should be, and there are many convenience features (a competent looking-for-group tool and HUD customization) that are flat-out missing. But BioWare’s plans never included throwing the baby out with the bathwater. All along their goal was clear: put story first. And these promises were not oversold. The Old Republic is, first and foremost, a story-based game, and since there are eight different classes to choose from, it’s actually sort of eight story-based games. Each class follows a unique plot line with interesting characters, fun missions, and stories that live up to the Knights of the Old Republic name. We saw a few of the classes’ quests unfold, and it genuinely feels as though each could have been its own full game. They would have been very different games, too - our Sith Inquisitor’s plot was very political, with Shakespearian twists and turns, whereas the Bounty Hunter’s story was more fun, feeling like a space western set in the Star Wars universe. Leveling up was much more entertaining than it typically is in MMOs, and everything unfolded naturally (check out our impressions of levels 1-15, 15-30, and levels 30-45). Each faction has a large number of quests that are shared between all of the classes, but all of the characters have their own dialog options, making repeating the same generic quests with a different class a fresh experience. The dialog never felt like filler, or a time waster, or a distraction. On the contrary; it made The Old Republic feel like the first MMORPG that was actually a complete game. It made us excited to replay the game once we finished our first run through, and anxious to see what the other side was like. But we didn’t have to do it alone. Besides being able to adventure with other players, every character will also end up with a ship full of Companions that can assist them in battle, each of which has their own unique personalities. We didn’t fall in love with each and every Companion we found – some were actually quite annoying – but we did end up with a few favorites. We liked that we could give them equipment to make them more useful in battle and gifts to raise their affection, which improves their proficiency at Crew Skills. And, just as BioWare promised, the game is fully voiced, a novelty that never gets old. Production values are off the charts, with well-known voice actors playing major parts in the stories. There are some repeated sound clips from time to time, which becomes more evident as the game gets further along. It worked regardless, and made the game’s quests – which all too often dipped into the paltry pile of MMO clichés – have more meaning. Even though we were killing ten rats, blowing up six bases, or downloading data off of a computer at the end of a dungeon, we knew why, and we cared about it. More importantly, the stories do more than add context – they’re good, too. BioWare’s signature style of strong writing is consistent throughout the entire experience. Some dialog options will even have moral repercussions, sliding your player towards the light or the dark side of the force and giving them access to different cosmetic items depending on the side they end up on. Though we thought the choices were interesting and added to the story, we quickly realized that picking a side and sticking to it was the best way to get good items, essentially forcing our hand for the rest of the game. Description Players will explore an age thousands of years before the rise of Darth Vader when war between the Old Republic and the Sith Empire divides the galaxy. Choose to play as Jedi, Sith, or a variety of other classic Star Wars roles and determine your path down the light or dark side of the Force.